Yesterday's The World program on Public Radio International had a remarkable interview. 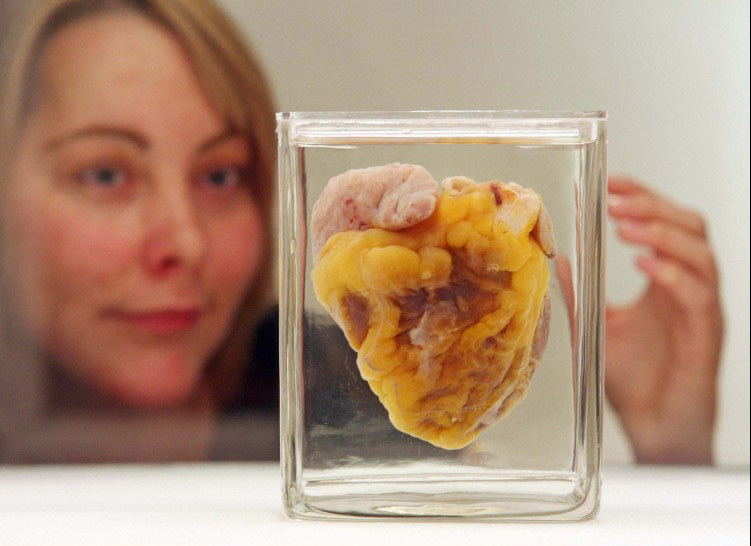 In June of this year, Jennifer Sutton, 22, underwent a heart transplant operation at Papworth Hospital, Cambridge, England. In the radio interview, she describes what it was like for her to examine her heart--literally. Her old heart. The one on display at the Wellcome Collection, just west of Friends House on Euston Road in London. As the Wellcome Collection's Web site explains, Sutton "had been suffering from Restrictive Cardiomyopathy, a condition in which the heart muscles stiffen, meaning the heart chambers are unable to fill with blood properly." Before the transplant, she was unable to walk more than a few meters without resting. Clearly, her heart was functionally inadequate for the life she wished to lead, and she was told she had maybe six months to live. I wouldn't be surprised if all over the world preachers were finding ways to insert this news story into their sermons. If you look into your heart, what do you see? Rigidity? Without a healthy heart, how can you stay in circulation? Actually, it's not a laughing matter, even as a metaphor. It just happened that, when I heard the story, I was in the weight room at Mount Scott Community Center. In fact, I was on the treadmill, doing the cardio part of my workout. Whenever I start revving it up on that machine, I touch my heart and tell it, "I love you." Thanks to The World and Jennifer Sutton, my words had extra weight this time. One more thing. I thought about Jennifer's heart on public display, for all the world to see. Normally our hearts are tucked inside us, never exposed to the light of day. The world of hardnosed realists doesn't honor hearts much, except in sentimental contexts--our leaders are supposed to be hard-nosed, ready to make the tough decisions. We know that their lives don't always match up to this cerebral ideal; sometimes their other private parts don't stay private enough, but their hearts, conversely, too often stay too private. Sometimes I wish I could speak to some of our leaders and ask, "In your deepest heart, can you really not believe that the president of Iran was seriously reaching out when he asked about Christian consistency in our president's policies? Is there not ever any doubt in your heart about the efficacy of coercion over respectful persuasion in dealing with the world? Do you really believe that access to regular health care should be subject to the law of the capitalist jungle?" I'm an organ donor, so I suppose it is possible that my heart will someday be inside someone else. I hope that the surgeons will judge that it will still give life and hope, as Sutton's new heart is doing now, and that the new owner will be able to touch it and say "I love you." Judy and I spent the Labor Day weekend at Quaker Cove Retreat, on Fidalgo Island, Skagit County, Washington. We were guests of North Seattle Friends Church. For three days we enjoyed the hospitality of North Seattle Friends and the camp, as we presumed to talk with them about radical hospitality, spiritual intimacy, and boundaries. We also didn't leave out our hopes and dreams of life in Russia. For me, the concept of radical hospitality is linked with my understanding of evangelism (as distinguished from proselytism). Evangelism is the persuasive, experience-driven communication of spiritual truth, combined with an invitation to experience a community formed by that truth. Without the invitation, evangelism is never complete, but without hospitality, the community is not truly accessible. If being a Friend is not simply a matter of happy historical accident, the reality must be as available as the theory. In a world full of competing loyalties and oppressions, evangelism must be rooted in God's love for all creatures. Practically speaking, it must have the recipient's best interests at heart; it must be truly liberating. Proselytism, on the other hand, simply aims at a transfer of the listener's affiliation from one spiritual home to another (ours); in the worst case, it serves our interests, not theirs. Hospitality is the door to spiritual intimacy, the lowering of the barriers of isolation and autonomy, and the formation of trust. I vividly remember when I realized that Jesus is trustworthy in a way that all the old authorities in my life turned out not to be, and that, in fact, a Godward orientation would mean a break from those old authorities. (This may not be true for some, but it was for me, having grown up under the old Germanic cult of obedience mixed with the poison of master-race mythology. Details available upon request.) Trust in the abstract was beautiful, but trust as I experienced it in friendships at Ottawa Meeting, my first spiritual home, proved decisive: I was a Friend for life. But most of us, including me, experience betrayal, and betrayal can limit our capacity for trust. "Once burnt, twice shy," I am not necessarily willing to be as trusting as the theory says I should. I want my community to offer healing, not necessarily to pander to my every allergy and sore point, or to the allergies and sore points that will be part of many newcomers' realities--the more so if we truly practice radical hospitality and welcome those drawn to us from the more authoritarian religions. That's why it's important to remember who is host and who is guest, and for the hospitality offered by us hosts to include deep listening and healing rather than an unseemly eagerness to be liked at any cost. But one of the final gifts we can offer in our combining of hospitality and intimacy is a clear and transparent path from the status of guest to the status of host. The host/guest distinction is an important boundary. Many of the controversies surrounding our Quaker institutions have been around issues of boundaries--theological, ethical, cultural. Deciding the boundaries has become incredibly politicized sometimes, but that in itself isn't the end of the world. Deciding boundaries is a worthwhile struggle--as long as the struggle isn't conducted unethically; as long as it is ultimately grounded in love for each other, in a deep desire for each other's well-being. If we don't talk about boundaries openly, they'll creep in anyway, in hidden patterns of elitism that ultimately guarantee stagnation and disconnection from the needs of the world. I've seen Friends meetings that proclaim equality but whose spiritual outreach consists of the sort of subtle mating calls that pretty well guarantee that anyone new will be socially compatible with those already there. We can do better--especially if our hospitality and boundaries are based on knowing who we are in Christ, rather than fear of who others might or might not be like. Russian blogs and Zemfira's many fans have been discussing her latest music video, "We break up." (Warning: violence.) I find both the song and the video extraordinary. As the narrator says in this interview, she has earned the freedom to make art, not show-business. And in the art, the video, is a beautifully detailed and horrifying enmeshment of gritty cruelty and love and fatalism. I want to believe that there's a hint of a larger perspective, a capacity for reflection about national experience, but I don't want to go any further, because it is enough that the clip causes me to reflect. I went to see Smith Eliot's show at the Bella Perla Gallery today. If you're in our area, please visit! When you're there, look for my favorite, "Waterlily." The announcement for this show correctly points out that "the process of making these works also echoes this theme: one appreciates immediately the beauty, but what makes the work compelling is the complexity of the process that went in to making it. Each piece has been photographed, scanned, lifted with emulsions, among other steps." Yes--the layers of careful process reinforces the depth and time-capsule quality of the pictures, their ability to defy distance and captivity. See and feel for yourself. I passionately disagree with this Cordesman quotation, in Roger Cohen's NYT op-ed, "The Least Bad Choice": "As Anthony H. Cordesman of the Center for Strategic and International Studies has written: 'It seems likely that the U.S. will ultimately be judged far more by how it leaves Iraq, and what it leaves behind, than how it entered Iraq.' America’s future ability to use its hard and soft power 'depends on what the U.S. does now. '” (NYT $elect) Absolutely wrong: the U.S. will be judged for the whole episode as one package. There is no way we will escape judgment for the summary dismissal of the inspectors, the marketing of the invasion, the string of deceptions, the lining up of compliant allies, the fixing of the evidence around the policy, and the sabotage of the U.S. Constitution and international law. It is moral weakness that substitutes lethal arrogance for respectful dialogue and persistent persuasion based on tested values; as long as we indulge that weakness, we can be sure that our exit will be all of one piece with our entrance: bloody, boorish, leaving a trail of unintended consequences. Susan Tedeschi prays, "Lord Protect My Child"
I need to retrieve a book on Radical Hospitality (Paraclete Press) that I lent out about a year ago. You put the insularity -- or perhaps peninsularity -- well. Evangelism is indeed good news; the keen eagerness that makes one feel trapped after a while lacks integrity because it is centered on the self -- or perhaps the corporate "self" in the case of an institution. The clue may be the rigidity of the barrier in which guest never quite makes it to the status of host. Then there's the question of what discipleship means regarding the "other" in love, as a seed, a child of God,as an extension of self. This does not require sameness. Seeds germinate into many sorts of flowers. But flowers need nurture to grow well -- and perhaps that is a part of being a good host. I recall the tradition in Scandinavia where the guest brings flowers to the host. I need to think of that for a while. Perhaps you have some ideas. well written, interesting, and beautiful blog. I thought about including a link to your site on my blog.